I have another Kokie Cosmetics polish to share with you today. This color immediately caught my eye, but I was hesitant to purchase it because it reminded me a lot of Zoya Yuna. I don't like buying dupes, but I couldn't help myself from really needing this polish either. It was just so striking in the bottle, so I took a gamble! Turns out, it was a good gamble because they're not dupes. I have a comparison below too. 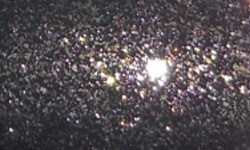 Cosmic Dust is a deep smoky grey with gold and silver glass fleck glitter. Color: They're not dupes and they're really not that similar either. Kokie's Cosmic Dust doesn't have the blue-tone of Zoya Yuna. 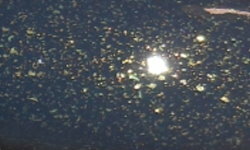 Cosmic Dust also has silver and gold glass fleck glitter and it's much more intense than Yuna's. I love this color! I love how it's jam-packed with glass fleck glitter. It gives creates a lot of interest while still being a smooth polish. Formula: This had an excellent formula. It was smooth, buttery, and easy to apply. I used 2 coats above. Price: I paid $5.99 for this at the Christmas Tree Shop. This is also available at Bed Bath & Beyond locations that feature a Harmon cosmetics section or on the Kokie Cosmetics website. Overall: I know on my last post on this brand, I enjoyed it but wasn't too keen on the price. I thought it was a bit too pricey for drugstore, but this polish changed my mind. This was a really well made and beautifully thought out polish. It's a definitely step up from the Sinful Colors range in innovation and formulation, so I think it does warrant the $5.99 price tag. I just wish this was available in more stores. I think this would be a brand that nail polish addicts and the general public would appreciate.